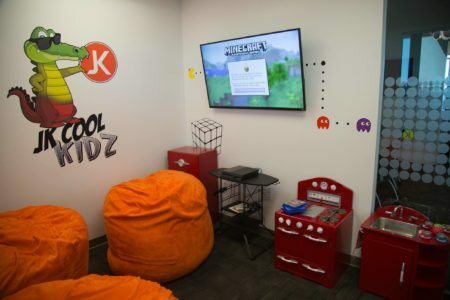 JK Realty, a progressive brokerage in Gilbert, Arizona, built an "open concept" office a couple of years ago, where they installed the JK Cool Kidz Zone to entertain kids in the office. 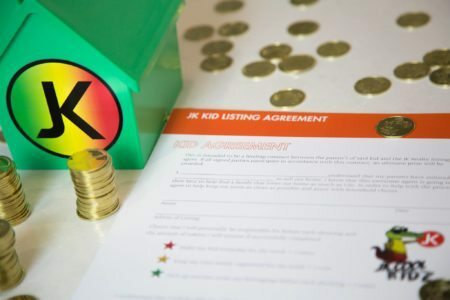 The latest innovation JK Realty is implementing is the JK Kid Listing Agreement. Gamification can be used to add fun to homeselling for kids; JK Realty allows kids to earn tokens that can be traded in for prizes for keeping up their end of a signed contract. Locals have known for quite a while the town of Gilbert, a suburb about 25 miles southeast of Phoenix, is a great place for families to live. Confirmation arrived this summer when Move.org ranked Gilbert as one of the top 10 best cities to raise a family in the United States. One local brokerage has embraced the fact that families dominate the area and has introduced some kid-friendly features into its culture. JK Realty, a progressive brokerage in Gilbert, built an “open concept” office a couple of years ago. There are no private offices, but there are conference rooms for private meetings. The brokerage also included a JK Cool Kidz Zone in the space, complete with flat screen, game console and bean bag chairs, so agents and clients can bring their kids to the office and keep them entertained. The latest innovation JK Realty is implementing is the JK Kid Listing Agreement. An idea of Kat Goldman, a JK agent, the listing agreement allows the children to be a part of the homeselling process. The contract is signed by the parents, the children and the agent. It states that the child is aware the house is listed for sale, and they agree to perform certain duties on a weekly basis. These include making their beds daily, keeping toys neatly stored and picking up and putting away belongings before showings. Each week they successfully complete these tasks, they are rewarded with a token. After the property goes under contract, they may redeem the tokens for prizes. They are also given a piggy bank in the shape of a home to keep their tokens safe. “It’s an emotional experience with smaller kids, and this helps them get involved in the process; and it helps mom and dad by giving them a bit of leverage point,” said Jason Laos, co-owner with his wife Kala Laos of JK Realty. “Kids grow attached to their spaces and their surroundings just like you and I do, so we give them a way to have fun with the process,” Kala Laos said. Logistically, the brokerage provides the colorful contracts, tokens and house banks. Agents who participate determine what the prizes will be for tokens earned per the contract. Kat Goldman, who created the idea and had implemented it as well, has used the Xbox game console as the prize for the contract tokens. To see more of the project, here is the video JK Realty released to introduce the Kid’s Listing Contract. Bill Risser is vice president of new media and education for Chicago Title Agency in Phoenix. Bill assists real estate professionals by teaching them how to use social and technology tools effectively and efficiently.